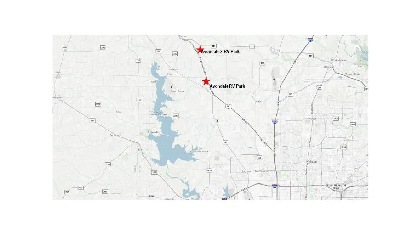 Avondale and Avondale 2 RV Parks are located 18 and 20 miles north of downtown Fort Worth. Please see our map for detail driving directions. Avondale RV Park has 30 sites and and Avondale 2 currently has 40 monthly and 4 nightly/weekly spots. Avondale RV Park 2 offer daily, weekly, and monthly rate. Thank you for visiting our website. Both Parks have concrete patio pads at each RV Site. Avondale RV Park is in the cozy northwest corner of Tarrant County and Avondale 2 RV Park is just 5 miles north on Hwy 287 at the corner of Hwy 114. Both Parks are within driving distance of Eagle Mountain Lake, a premier recreational and fishing lake in Northeast Texas. Outdoor enthusiast may enjoy an afternoon of relaxation on Eagle Mountain Lake or rent your own personal watercraft to cruise or fish on Eagle Mountain Lake. If you are into nature, The Nature Center at Eagle Mountain Lake is just five minutes away. If you want to play some golf, you're in luck because Willow Springs Golf Course is just two minutes away. For you avid NASCAR buffs, the Texas Motor Speedway and Alliance Airport are just 12 miles away. Fort Worth's charm and sophistication offers world class shopping, spectacular live music, an amazing variety of restaurants, Cowtown's Stockyards with the daily parade of the Fort Worth Longhorns, Rodeo Arena, plus an abundant amount of cultural events, museums and miles of natural beauty. Avondale and Avondale 2 RV Parks are just a short drive to from downtown Fort Worth and 4 miles from Lake Worth and Saginaw. RVs with 30/50 amp service with daily, weekly, and monthly rates. Pets are accepted but must be kept on a leash at all times. Avondale RV Park is located 18 miles north of Fort Worth. Please see our map for detail driving directions. Avondale RV Park has 30 sites and has daily, weekly, and monthly rates available that include all bills. Thank you for visiting our new Internet site. Additionally because we have limited amenities we do not allow children for long-term stays. For an aerial view of both RV Parks, we suggest you look at us on Google Earth. The emphasis of our site is on helping you find a conveniently located RV park that will allow you to be close to Fort Worth and visit all the area events, restaurants, and happenings at a very affordable price. If you are not familiar with our park and this is your first contact with us is online: We would be pleased to hear from you! Please let us know what your needs and questions are, we will be more than happy to help. In brief, you should know the following about us: Avondale RV Park is 10 years old and located at 13801 Hwy 287 & 81 N, Fort Worth, Texas 76179. We are currently also in second construction phase of Avondale 2 RV Park and have open the initial phase of 40 sites. Thank you for stopping by Avondale RV Park!